"This is an ideal opportunity to enjoy skiing in the "Little Tibet" of Italy, at 1816 m above sea level, with 115km of perfectly prepared slopes, modern mountain railways, one of the biggest snowparks in Europe at the Ski Area Mottolino," said a resort spokesman. Prices start from €150,00 per person for four nights bed and breakfast in a hotel. Half board and full board stays as well as apartment holidays (minimum seven nights) are also available. Book direct and ask for the SkiPassFree offer. 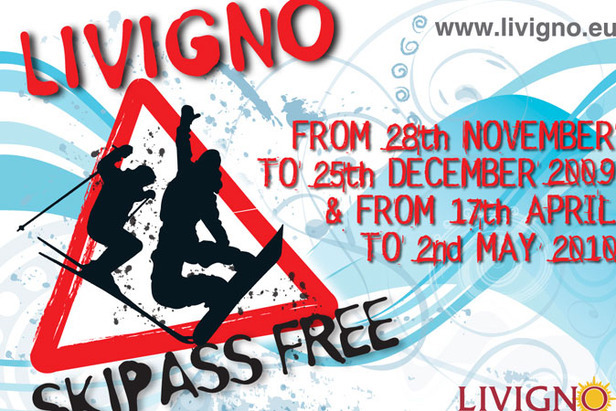 Children aged up to seven (born in 2002 or later) don't pay for a lift ticket at Livigno all seasonand receive a free lift pass on purchase of the same ticket by the accompanying adult (from 3 to 21 days). Livigno also now has a new snowpark at the Skiarea Carosello 3000 for every level and age. Snow is guaranteed thanks to the resort's extensive snow-making system which assures the coverage of 80% of the slopes. "Livigno has a lot to offer for a wonderful winter holiday with your partner, your friends or your family: good snow, traditional Italian food and a genuine atmosphere, surrounded by a breathtaking Alpine landscape." said the spokesman.